Making automata is hard. It requires a wide range of construction skills and an understanding of certain mechanical and engineering principles. This can be very frustrating for the beginner but help is here now with this inspiring video featuring Keith Newstead, one of the UK's foremost automata makers. The first half of the DVD is divided into the following sections: Levers, Cranks, Linkages, Cams, Shafts & Bearings, Ratchets, Gearing and Drives. These sections include examples from everday life as well as pieces that Keith has made. 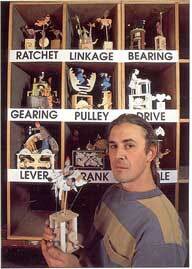 The second part concentrates on some of the ways the mechanisms can be put together to make automata. As well as helping budding automata makers, the DVD is also widely used by students and teachers of National Curriculum Design and Technology. Running time is approximately 42 minutes. Available from CMT.